I am extremely privileged to become a family member of the YippieYo. 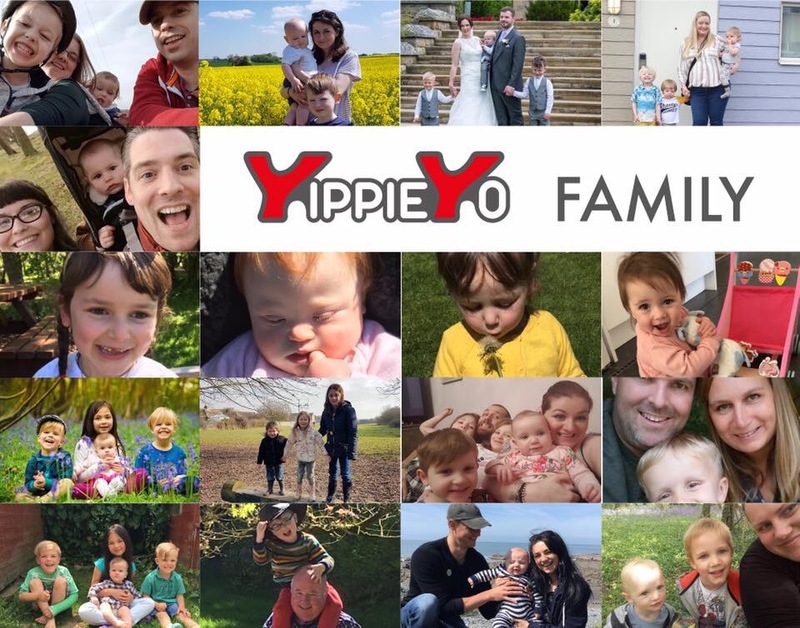 I never like to back anything without believing it really is a good product and can honestly benefit my family as well as other families out there, and I can not be happier to promote the YippieYo. Today Dad went to a party for a few hours with BG. I was home alone with our 2 boys bouncing off the walls and destroying everything! So I decided to try our YippieYo and go out. Now before, I honestly can say I would never have taken MO, SB and BBG out. Due to MOs autism he can be very voilatile and it doesn’t take much to go into an Austic Meltdown, leading to him not being aware of dangers and running into roads. So if I had any other children I would generally stay indoors or have another adult with me. 3- actually try the YippieYo out! I put the YippieYo up with a pull of a pin and locked the handle into place, I then just clipped the seat back onto the frame, by using 2 easy to use clips. I was a tad worried with my boys robust and tornado like character these clips would break. I can testify the boys at one point were fooling around and pulling and tugging and I held my breathe looked where the clips were and to my astonishment they were still working perfectly! I then got my bag and placed it on the purpose built shelf behind the seat, the bag is really big with lots of storage and compartments including 2 bottle holders on the outside. 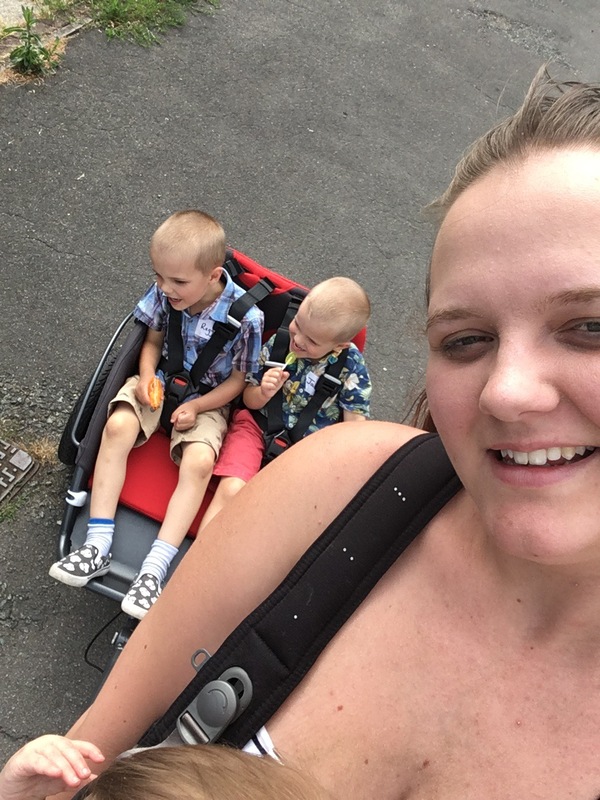 This then clips securely on to the actual pushchair meaning when out and about and bumping around it is safe and secure. 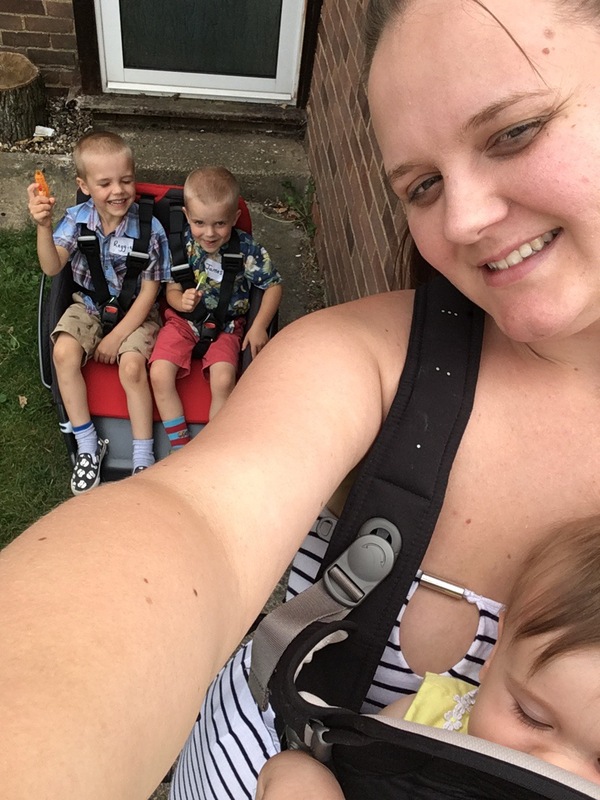 The only thing is it is behind you so you can’t see if anyone has taken anything from your bag however they can’t easily take the bag off the pushchair and trying to unzip a bag while it’s moving without being seen, isn’t impossible but it’s highly unlikely to happen. 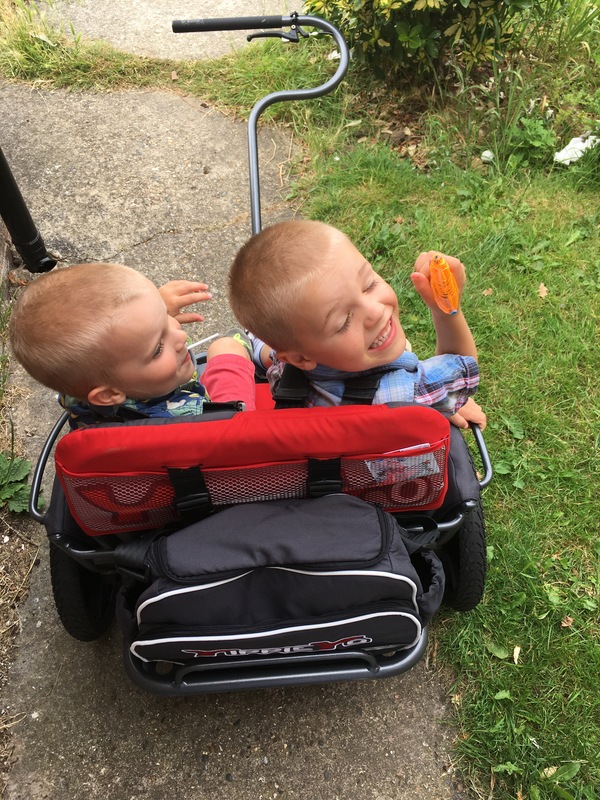 Thankfully my boys saw the YippieYo come out and ran to sit in the new ‘chariot’ they have nicknamed ‘beauty’. I managed to sit both boys into the YippieYo perfectly, infact they have room to grow! They were safely buckled in to what I can only describe as a 5point harness from a car seat. Infact when we got to my parents house my dad was testing this out and throwing the YippieYo up and down and the boys remained locked in and didn’t move an inch. I had BBG in her carrier and I started to head off to parents. I was so worried we would get 100metres down the road and I would be exhausted from pulling my 4 and 5 year old. Although in no time at all I was at my mums house just over a mile away. It helps that the handle is quite long meaning that you can pull the YippieYo and your arm can rest by your side not straining your back or shoulders. The YippieYo was light and went up and down curbs without any tug, we even went to the local store and brought a drink with no problems, and a cheeky fish and chips. On the way back I decided to let the boys out to have a little run in the local park and the YippieYo just transitioned from tarmac/concrete to grass so easily I was shocked. The fact the YippieYo you can get LED lights to attach to the frame is brilliant addition as this means when it starts to get darker we can still walk home from my parents in the knowledge we are visible to cars, especially living in a village is such a huge weight off my shoulders. To get the YippieYo down again is just as easy as putting it up, unclip the seat buckles, fold the seat down, then pull the pin on the handle and fold the handle down. It is quite compact but you can compact it even more by taking the quick release wheels off. I’m already excited to see BBG use this pushchair, especially knowing that the support straps are the best I’ve seen in any pushchair as they are pretty much car seat straps. 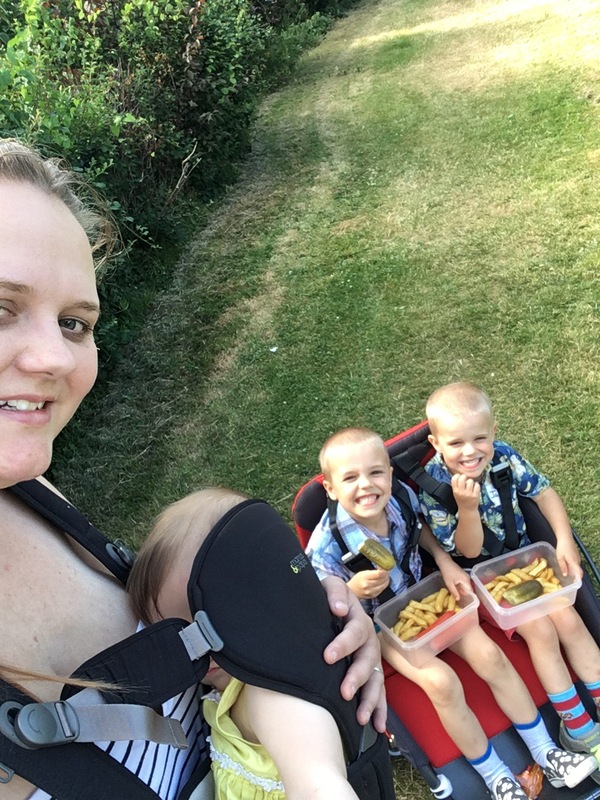 The fact that it is big enough for my boys also means if she does walk she will have somewhere to relax on days out or if she can’t walk we can access non wheelchair friendly places easily with the YippieYo. I can’t wait to go out and explore the fields tomorrow with the kids and not have to worry about any meltdowns or tired legs as I know I can put MO straight into the YippieYo which acts as his safe zone, safe in the knowledge he is secure and safe and can’t go anywhere as he can’t undo the buckle. Th YippieYo has meant I can now go out alone with the children and not worry so much, that I am not house bound or needing adult help and to me that is like winning the lottery! Watch out on my Instagram page for our adventures out and about with the YippieYo. Previous Post Half Sibling…. no they are siblings!